His and hers. Rugged and refined. Classic and contemporary. 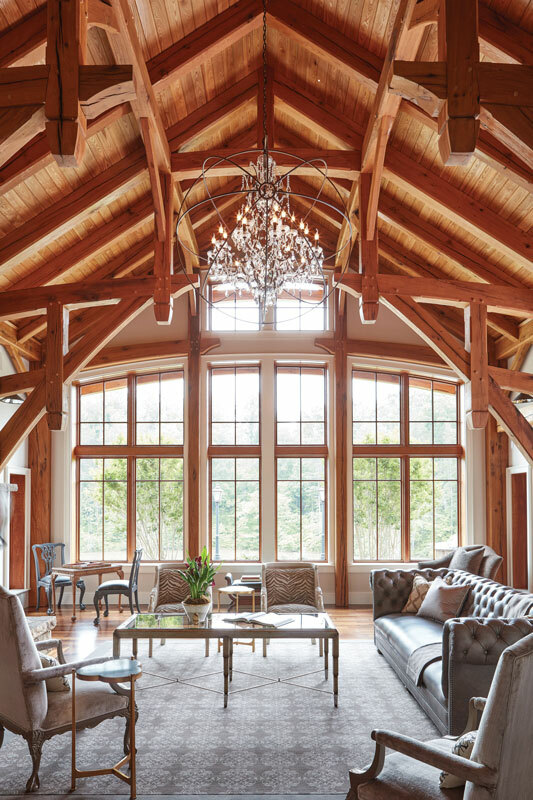 Bella Woods, an extraordinary timber frame home with a sumptuous interior, is a statement in contrasts. 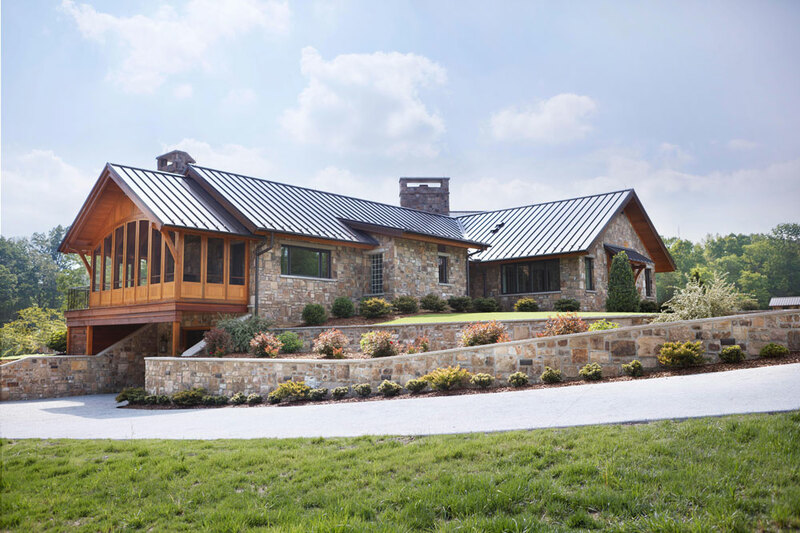 Under the guidance of a skilled team of design and construction professionals, its distinct elements of architecture, technology and furnishings come together harmoniously, creating a home that represents a new level of grand American style. 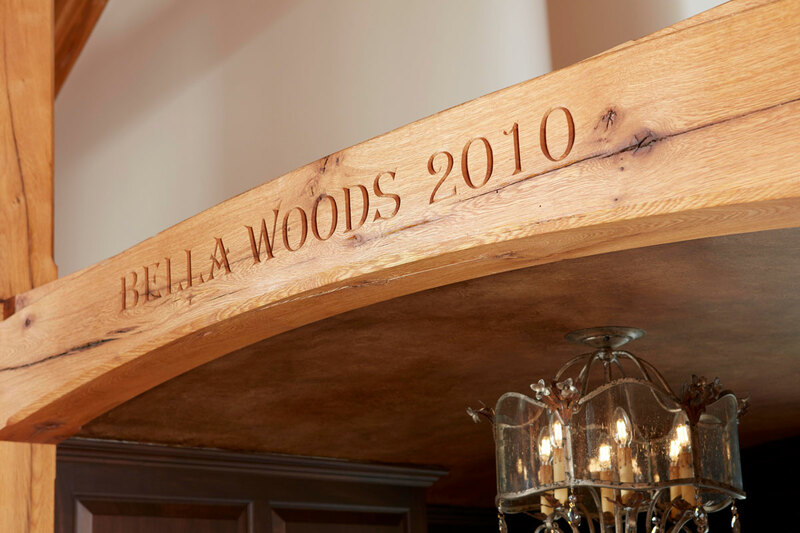 The name, Bella Woods, which means “beautiful woods,” immediately reveals some insight to the home’s history. The location, a 200-acre parcel in North Carolina, is replete with pine and mixed hardwood forests, two ponds and various elevations. The owners purchased the plot in 2010, and the next year, Bella Woods was conceived and eventually built in a small interior meadow overlooking one of the ponds. Bella Woods is a true mixture of homeowner Ruth Williams and her husband. He loves the warmth and masculinity of wood while Ruth’s preferences lean towards classic grace and sophistication. 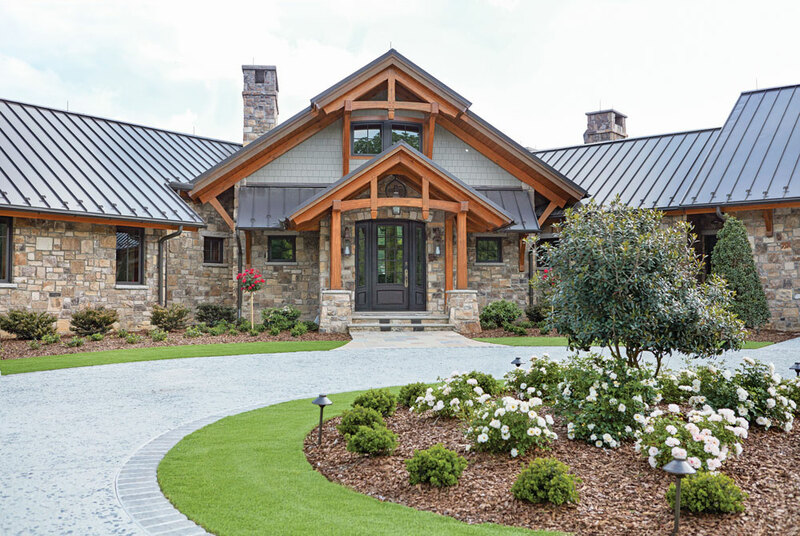 Both were attracted to the history, assertive strength and permanence offered by a timber frame home. “A timber frame is a tremendous wood sculpture, and I wanted to let the structure speak out as much as it could.” Ruth says. “However, I thought to myself, ‘How can I un-rustic this?’ I like to do things that are unexpected." In Bella Woods, the unexpected permeates every aspect of the home, starting with the timbers themselves. Timber is a significant part of the architecture and spatial design, but other areas deliberately break away from its ruggedness. 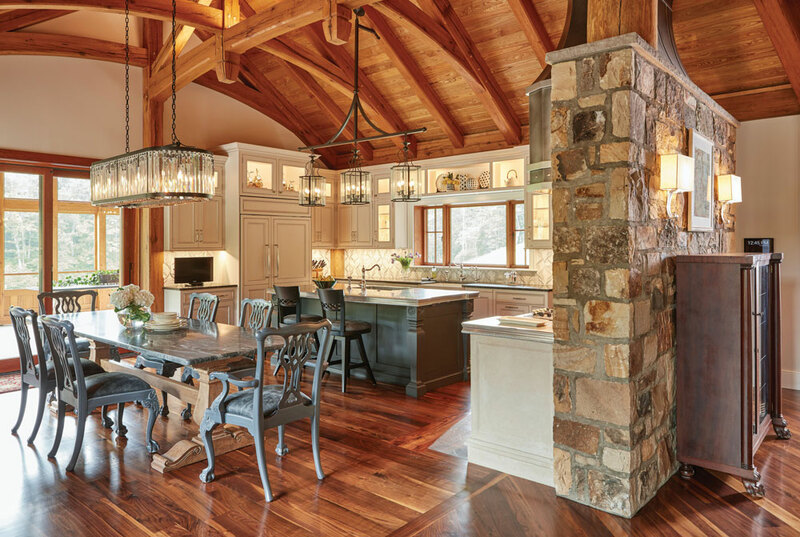 Ty Allen, the design-build manager at New Energy Works (NEW) known for his ability to create lyrical timber frame homes, insisted on modernizing some traditional details. By doing so, the reclaimed oak frame accentuates the transition from rustic to refined. “Ruth wanted a traditional hammerbeam style frame. To prevent it from looking clunky we used long, double-sawn braces where the top and bottom have different radiuses — almost like tree limbs,” explains Ty who served as Bella Woods chief architectural designer. 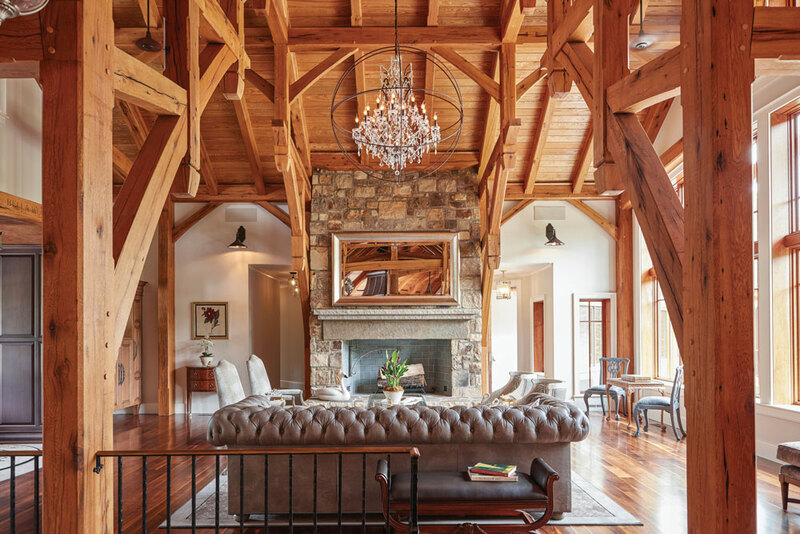 These beams were designed and executed by NEW’s sister company, Pioneer Millworks. Additionally, the acorns of the king and queen posts were carved to be more square rather than the customary rounded appearance. “These types of details opened the door for different types of personalities,” says Ty. To bring these distinct interior personalities to life, Ruth turned to Susan Wilson of SublimeLime Design. While the timbers brought longevity through their form and traditional history, Susan found timelessness in the furnishings through recovering currently owned pieces and making what was once old, new. “In the end, we created a beautiful example of a genuinely ‘collected’ home,” explains Susan. 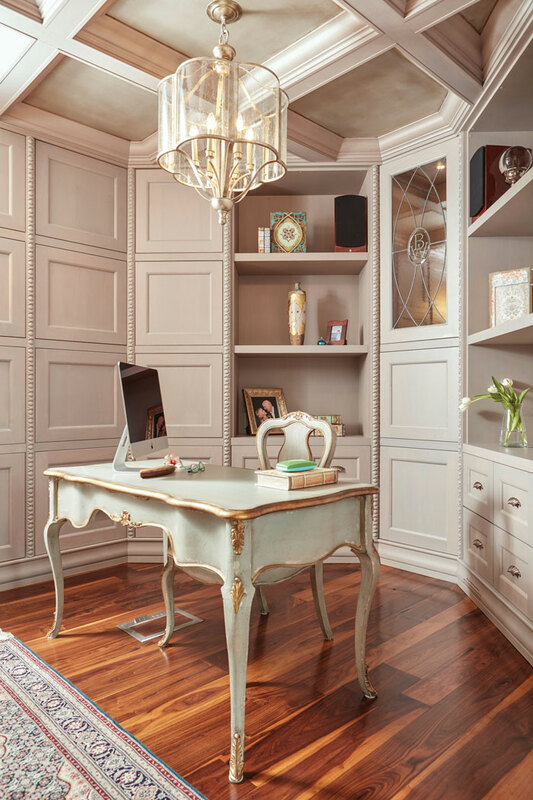 Those collections, along with careful selections of high-end cabinetry throughout the home, faux paint textures and other glamorous pieces create a balanced contrast. In some places it’s subtle. 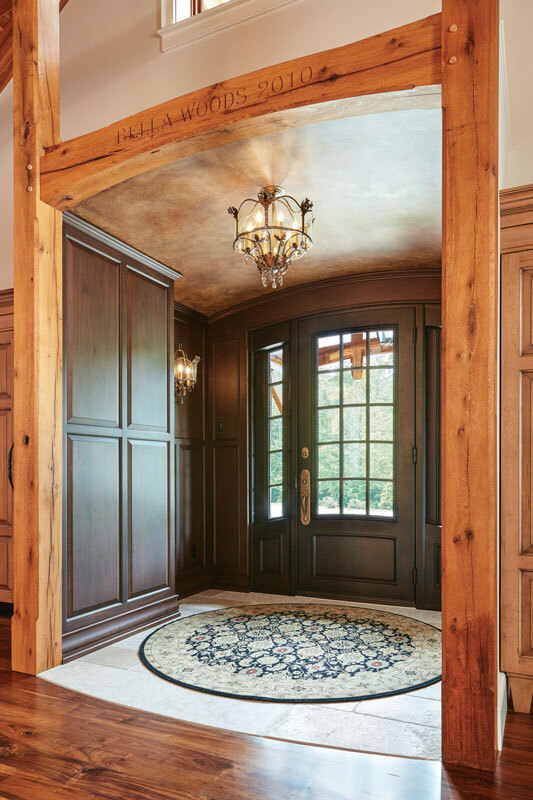 The entry foyer is one example, with its dark walnut panels crafted by fine-cabinetry manufacturer, Wood-Mode, and faux leathered paint. 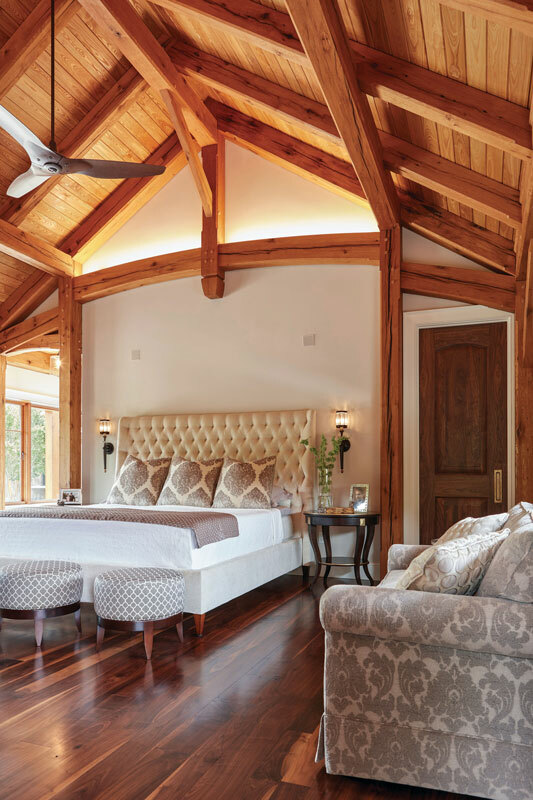 In others, drama steals the spotlight, such as the two guest bedrooms in distinct masculine and feminine styles. 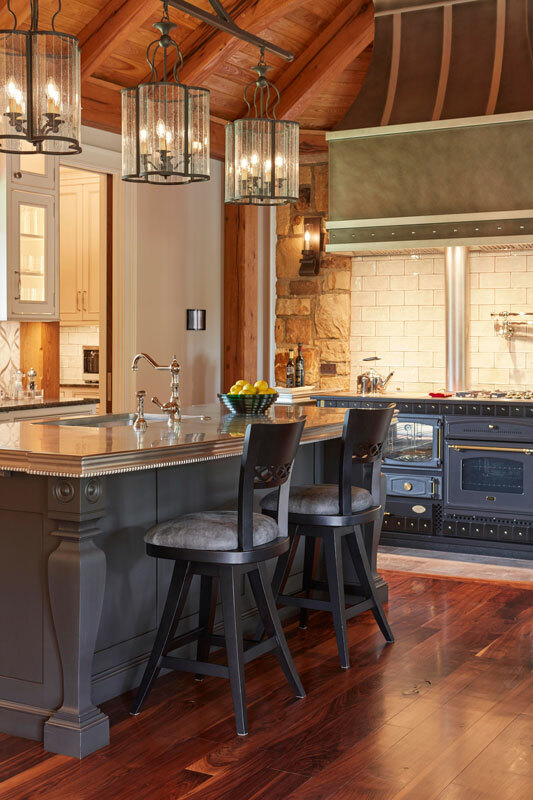 Other notable unique features include pewter countertops and the Italian Anselmo Cola stove flanked with stone pillars and a marble tiled backsplash inlaid with aluminum. The lower level boasts an exercise room and a breathtaking Old-World style stone-and-American-chestnut wine cellar. Even the home’s footprint is unusual. It’s a large “X” centered around a great room. 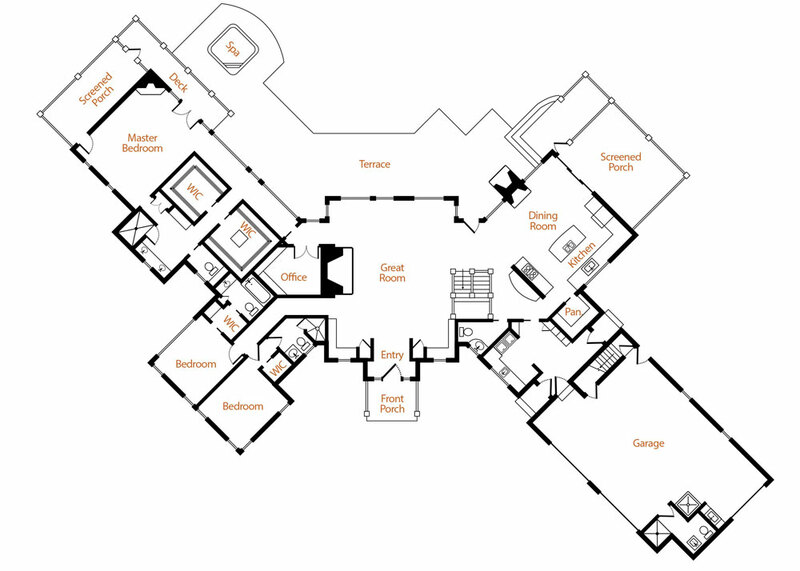 The arms splay out into the landscape providing distinct living zones: a kitchen and dining area, a five-bay garage and mudroom, the master suite and a guest suite. Ruth loves a party, and the 3,000-square-foot stone terrace overlooking the pond easily accommodates large crowds. The screened porch, adjacent to the kitchen with a 10-foot-wide sliding door that retracts into the wall along with an outdoor kitchen, hot tub, and fireplace extend the living space. The exterior is dominated by glass, local stone and timbers. There isn’t much siding. “The mix of stone, glass and wood are emphatic in this house. The exterior foreshadows the interior,” says Ty. The exterior hides another key element; its high-performance enclosure. 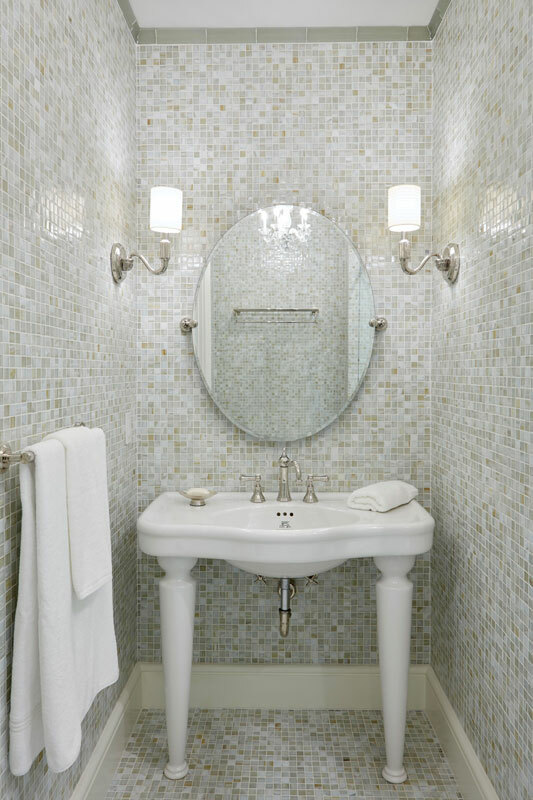 NEW is especially adept at incorporating sustainability and energy efficiency into its designs. Ty utilized what he calls, “continuous outboard insulation” and Bella Woods’ thick walls (2-by-10-inch framing) allowed for additional insulation. For Ruth, Bella Woods has everything she and her husband could need or want. It houses their collections of antiques, wines and cars. Quiet weekends, big parties and time spent target shooting with friends are all accommodated. “It’s perfect,” she says.